Restaurant Matties is a little cozy restaurant at one of the most picturesque canals of Delft. 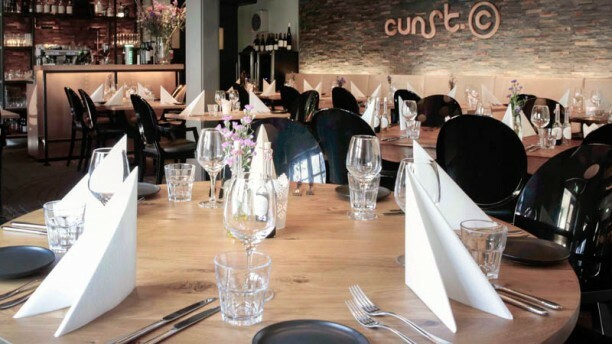 You can have a nice dinner or a tasty lunch at this restaurant, where fresh ingredients and homemade dishes are the standard. In addition to the normal menu, there is also a week- and a month menu with all kinds of products that will be used in that season. Friendly service and good concept. We took a chef’s surprise 3 course menu and everything was delicious. It was a bit too dark. The food was tasty, good spiced and as far as we could see beautifully arranged. Interesting restaurant with interesting concept: all dishes medium-small sized but each below 10€. Good and creative dishes, very good wine selection. Some problems of the good concept of Cunst: if you're hungry you have to go for 4 dishes because some are REALLY small. They offer 3,4 or 5 course surprise menue. Not bad but the surprise is that each of these courses is part of the menue list consisting of appr. 10 positions in total. In this case: better order what you want. Be careful with ordering accompanying wines: very good wines reasonably priced but for each small-mid sized course you get a decent glass of wine, difficult to catch up with the wine until the next course is coming, at the end of a 4 course dinner you have consumed a bottle of wine per person: some might like it, others not. Recommendation for the team: better to offer smaller quantities of your delicious wines at a lower rate.